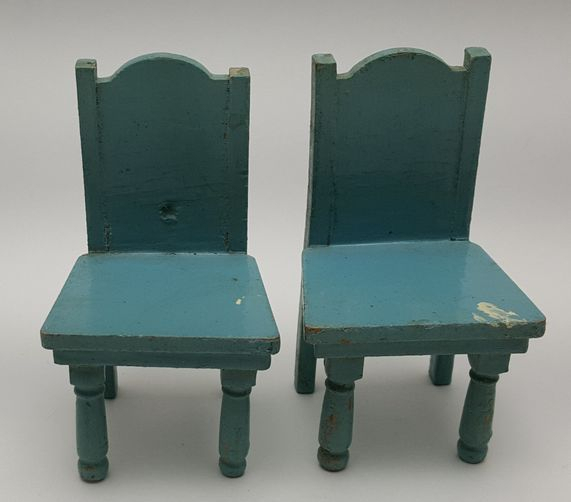 Pair of 3/4" scale German chairs. 3" tall to the center back, 1 5/8" wide at the front of the seat. The chairs are in fair to good condition with play and age wear, the chair on the left has a small puncture mark on the back rest that looks like it was done in the factory since the blue paint is in the dent. The chair on the right has a dab of white paint on the seat and the chair on the left has a dot of white paint on the seat. It looks to me like one or two legs on one chair may have been re-glued. They are not marked, but I have some stained chairs that look like these that are marked Germany.